One of the best parts of being from the SOUTH (yes, I mean of the US, not Sønderjylland or South America!) is ICED TEA! 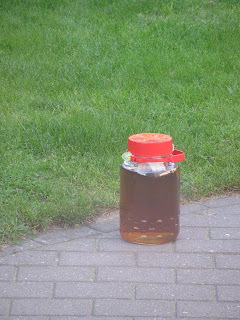 And as all those good southern gals guessed on my last blog, the GIFT from Patti from Poland was a giant jar to make iced tea! But not just ANY OLE ICED TEA.... 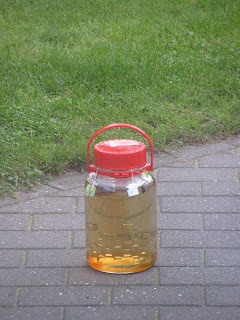 It is to make SUN TEA! The most ecologically friendly version of "the wine of the south"! There was a bit of curiosity from my non-Southern gal friends about how in the heck this big ole jar could help me in my endeavor to bring the SOUTH to Denmark... So let me illustrate. 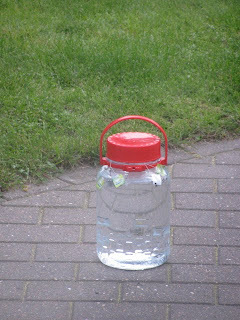 Step 2: Set the jar outside before you go to work in the morning. Step 3: Be patient and let the sun do its thing. Step 4: While you are being patient, remember to cross your fingers that today is a day that there is actually SUN in Denmark! 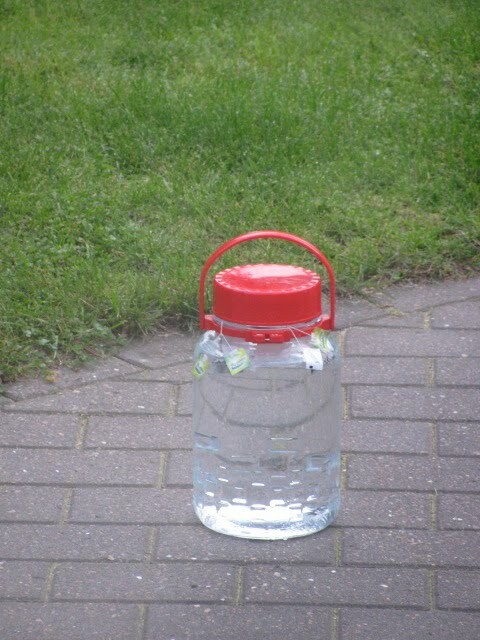 Step 5: Come home from work and go outside to see what magic the sun has performed on your big glass jar from Poland. Step 6: Bring the jar inside, throw away the tea bags and pour your beautiful "wine of the south" into tea pitchers (that's what we call 'em where I come from...) However, if you live in DK, you have a VERY SMALL refrigerator, so you might have to pour the contents into a few smaller pitchers. Step 6 1/2: If you are a sweet tea drinker, now is the time to add sugar. However, I am not. I am a good old-fashioned unsweet tea drinker... I like it pure and natural. But if you must have sugar.... add it now. All I know is that it takes a cup-ish of sugar for 2 quarts of tea; no clue what that means in metrics! Step 7: Chill for a few hours. Step 9: Take a big swig and say, "ahhhhhhhhhhhh....."
Now you see why we call it "the wine of the south"! So, does it taste different because it has been brewed in the sun? Fascinating! 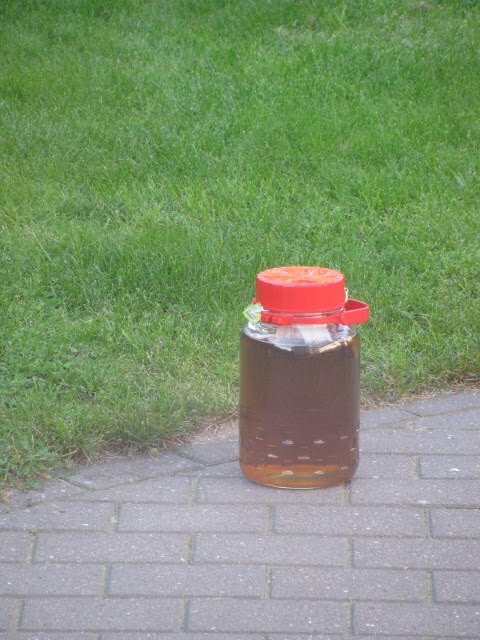 And do they make sun tea in Poland or is the jar used for something else? And I have no clue if they make tea in Poland??? I will have to ask a Polish girlfriend of mine and find out! :-) My guess is that the jar was intended for other purposes...but you never know! My guess is that they use the jar for pickling in Poland, but I digress. 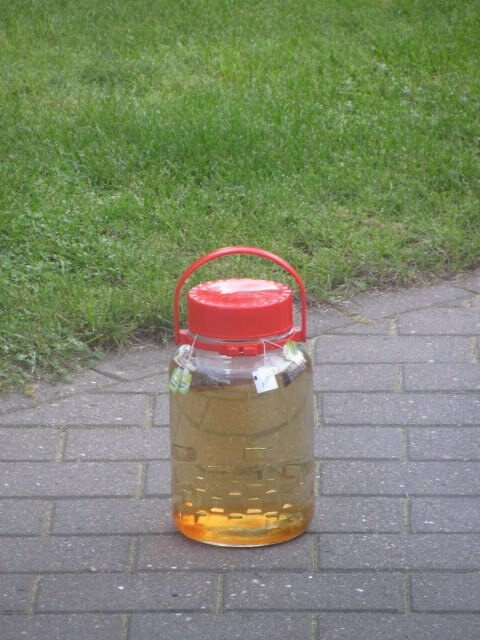 I love real iced tea, but I fear our plight here in Denmark is...forgæves. My husband used to inhale those bottles of Nestea, that have nothing to do with the real thing. Took him to Texas, he ordered iced tea, took a sip, just about choked. Yeah, honey, in Texas, iced tea is TEA THAT IS CHILLED, not some artificial flavor in a bottle of water. Kelli, I just want to thank you for saying ICED tea. How many brain cells have I expended on being aggravated over seeing "ice tea" (and "mash potatoes") on menus over the years... (Oh, the burden of being grammatically perfect...) As a witness to real suthun' sweet tea a few times, this stuff is HEAVENLY! !